One month before your annual online surveys licence is due to expire, the online surveys support team will create a payment and issue a reminder email. This will be sent to your account’s Primary Contact and Billing Contact. 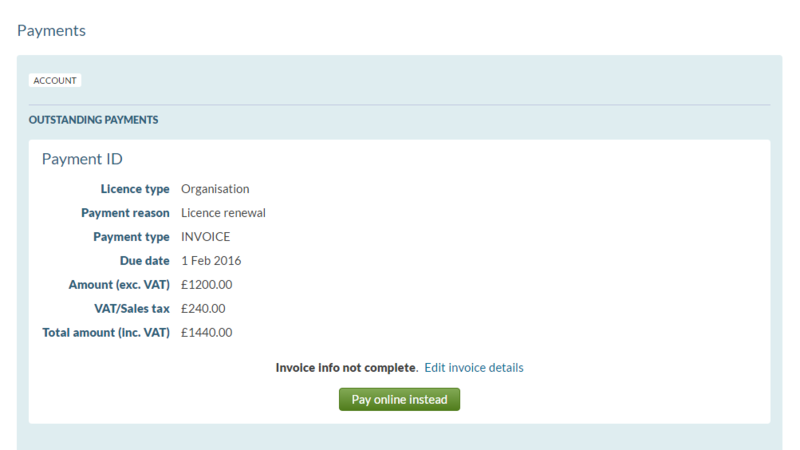 Any Admin user can, from their Dashboard , click Manage in the top-right corner and select Payments to view the open renewal payment. Organisation or Project account Admin users will initially be prompted to edit the details required for an invoice. Single-user accounts cannot request an invoice. 1. 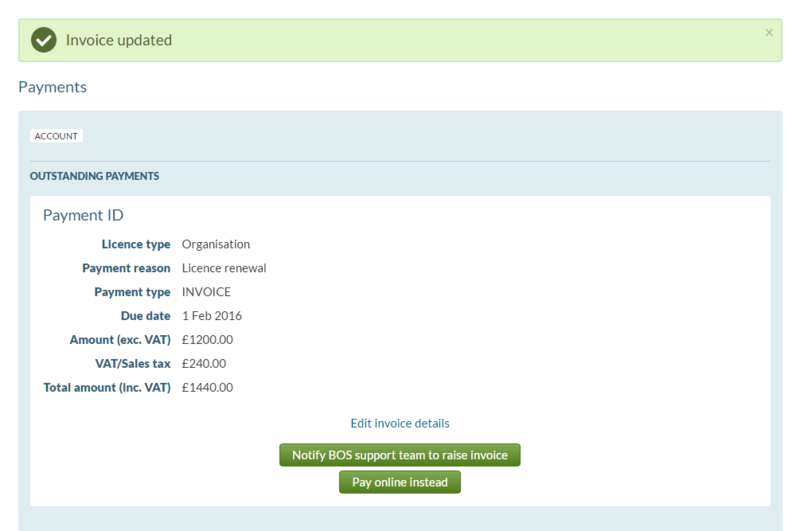 On the open payment, click Edit invoice details. 2. Raise a Purchase Order and complete the form with the information necessary for the online surveys Support team to issue an invoice (including the raised Purchase Order number). 3. Once you have input the required information click Update invoice details. 4. You will be returned to the payments screen. 5. Once you are happy that all the information is correct and an invoice can be issued by the online surveys Support team, click Notify online surveys support team to raise invoice. 6. The online surveys Support team will issue an invoice as quickly as possible and renew your licence for another year. Single-user account users will be prompted to pay online with a credit card. Organisation or Project account Admin users will initially be prompted to request an invoice but can choose Pay online instead to pay by credit card. 1. On the open payment, click Proceed to payment gateway. 2. Have your credit card to hand and follow the on-screen instructions. 3. Once your payment is authorised, your account will automatically renew for another year.